Gravedigger's Local 16 – Page 2 – "What is he that builds stronger than either the mason, the shipwright, or the carpenter?" You might remember Benjamin Fouché as the man behind Spookinite Valley. This year marks his debut novel, Shadows On The Wall. 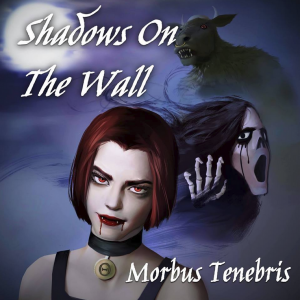 This year also marks his musical debut with a tie-in album for the novel under his side project, Morbus Tenebris. It’s a story of a haunted house-themed sideshow attraction called “Gravestone Manor” whose facade artwork delivers exactly what it promises. 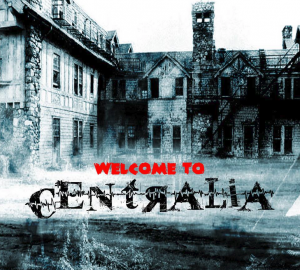 Sadly its monsters and supernatural beings are all too real…and all too deadly. They also have the ability to leave the attraction! It has claimed many unsuspecting victims as it materializes in various carnivals and fairs and the novel tells of the protagonist’s life being forever changed by three beings from the attraction: The spectral Funereal, the monstrous Odious and the vampiric Luminita. I’ve only had a chance to read a little of it and it’s kind of like if H.P. Lovecraft got sick of tentacled horrors beyond imagination and decided to write about a haunted attraction that’s truly haunted. Creepy organ music takes us into “Lost at Midnight.” It offers lots of variations until it briefly stops and takes on a grander (and vaguely circus-like feel). The use of soft wordless female vocals and the constant tolling bells near the end were great touches. “Shadows on the Wall” also has a grand feel thanks to its soft piano work, mysterious strings and pipe organ work. Tolling bells briefly join in to contrast with piano. Fans of string work will particularly enjoy this track, especially the solo segment. This eerie track is perfect for a haunted mansion. “Mural of Horror” uses mournful strings and wordless female vocals to create a creepy, almost mystical feel. There’s also some nice use of heavy piano work towards the end. But don’t think you’re limited to using this with scenes involving witches and wizards. Halls of portraits and graveyards would also benefit from being paired with the track. You could also use “Midway Memories” with a graveyard scene due to its sad and dismal feel. It’s a combination of both heavy and light piano work mixed with violins and occasional blasts from a pipe organ. Its circus midway feel isn’t “in your face” and sometimes vanishes from the track, so let’s use it in an area where that works to its advantage: a haunted sideshow. After passing the signage and ticket booth, guests enter a room with several displays. 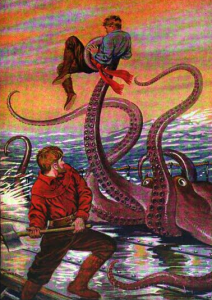 In addition to the “FeeJee Mermaid,” they can also see exhibits like strange fossil, a skeletal human spider, creepy things in jars and a caged gorilla. Said gorilla’s cage is directly across from the exit so it can chase people into the next room when it escapes. The dark tones and interesting string work of “Sanguivoriphobia” remind me of a predator surveying the area. 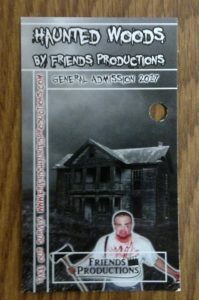 Although the title refers to having a fear of vampires, you can use it with any monster scanning your haunt for victims. 6’+ Episode 239 is Up! “Cold Breath” combines slow, chiming bells (which might remind you of a music box) with otherworldly backing touches. Said backing touches change to compensate for the track’s steady backing beat. Some parts sound kind of like gusts of wind while others sound like cries or vocals. So why not use it in a room set up like a haunted nursery? Having a hidden oscillating fan blowing the curtains would be a great touch. The low pulsing tones of “Coming After You” ooze darkness and dread and creates feelings which live up to its title. Since some parts remind me of a chiming grandfather clock, let’s recreate the sinister chamber from Edgar Allan Poe’s “The Masque of the Red Death.” Hanging black fabric all over the room is simple enough, but the story’s braziers of fire projecting light through panes of red glass will have to be replaced with fake flames and temporary walls with red plastic windows. Creating a prop grandfather clock is nowhere near as difficult or expensive as one might think. Just be sure to paint it black too. The flickering lights will keep it from blending in with the background. I recommend having the Red Death sneak up on visitors while they’re inspecting the clock, but you could modify the clock so a performer can leap out of it if you wish. The costume for the Red Death can be a black hooded robe covered in “Creepy Cloth” and the mask can either be a corpse mask painted red or one of those red metallic masks which flood stores every October. Don’t forget to sprinkle on some fake blood! “Deep In Chaos” offers eerie low tones from beyond while “Resonant Evil” picks things up slightly with an undercurrent of evil. Its increase in volume wonderfully implies something has been summoned, so it’s a must for a séance. It also flows nicely into “Something Powerful Approaches,” which delivers the feel its name promises. You could even use this as a substitute for a distant storm approaching if you play it at a low volume. “8-Bit Vampire” is a surprisingly happy keyboard track. The contrast between the backing music and main beat is nice, although it’s not very scary. But it is a great track to switch over to if kids find the other music too scary while they approach your front door on Halloween. “Brooding Saint” is a wonderfully creepy organ composition. There are plenty of variations and is a more lively than your standard “haunted organ” track without sounding too happy. I love its very rich sound. This and a strobe light will make any static phantom organist prop seem more alive. I only wish it faded out rather than suddenly stopping. That way it would be much easier to loop. But don’t let such a minor quibble keep you from picking it up, as Collection of Creepy is worthy addition to any haunter’s music collection! It’s not the only ExPsyle album with spooky music! With that in mind, let’s take a look at Music Box Melodies. Midnight Syndicate is currently performing in their live “Conspiracy of Shadows” show at Cedar Point’s “HalloWeekends” event. Not only will they be performing several shows every Friday, Saturday, and Sunday through October 28th, but you can meet them afterward to take pictures and get merchandise signed! 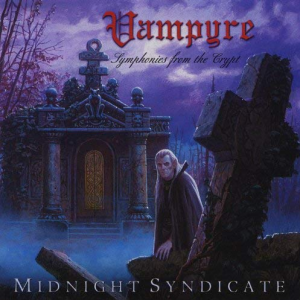 It wouldn’t surprise me if many fans bring copies of the band’s early album Vampyre – Symphonies From the Crypt, the artwork for which was created by famed Dungeons & Dragons artist Keith Parkinson. The uneasy opening of “Awakening” uses soft wordless vocals and tapping to slowly build up to crashing gongs. Said gongs bring in a sweeping, regal feel and the pipe organ work brings classic Hammer horror movies to mind. The use of bells and horror movie stings further enhanced the mood. This could easily be used in a haunted throne room, vampire’s lair or even the opening room of a haunted house with a vampire theme. “Graveyard” can be used in a graveyard or funeral parlor scene thanks to its moody low opening and soft light touches which lead to mournful string work. The touches of wordless female vocals are greatly appreciated. Its great ending build leads to “Unhallowed Ground,” where the loud crash of a gong snaps listener out of mood from the previous track. More gongs, wordless unisex vocals and piano work soon follow. Amazing organ work takes over for a spell, but the other touches soon find their way back in. It’s spooky and epic, with plenty of great piano variations. A pipe organ solo gets more variations and is joined by new wordless unisex vocals which react to musical changes. The overall effect is simply breathtaking. “Crypt of the Forsaken” begins with a low creepy tone and gongs. Wordless unisex vocals and string work joins in, although I should note how the wordless female vocals are easier to make out than their male counterparts. The overall feel is pounding and steady. If you have a vampire’s crypt in your haunt, why not use a variation of the “girl to gorilla” illusion? Guests hear a vampire hunter yell for someone not to do something just before they enter and see a vampire’s lackey pull a stake out of a decayed vampire’s chest. As the lackey struggles with the vampire hunter, the prop corpse (or skeleton) suddenly changes into a fully restored vampire! Naturally the guests will be chased into the next room. It turns out that “Winged Fury” is one Gavin Goska’s favorite tracks and is “broken into different movements revealing different sides to this creature of the night.” The clashing cymbals and driving violins get the listener hooked before it occasionally adds in soft gongs, an interesting harpsichord effect and other musical tones I can’t quite place. Wordless male vocals can be heard in the distance add to the feeling of something stalking and flying about in pursuit. Wordless female vocals join in for a nice contrast with the variations in the wordless male vocals. I loved the focus on violins at one point and how it added creepy musical strikes later on (which were enhanced by more wordless vocals). You simply have to experience this for yourself. Haunts with a vampire theme could use this in a bat cave, but haunters using other themes might want to consider pairing this track with zombie birds. Verne Langdon had practically done it all before passing away in 2011. He had worked in television and movies, he ran a wrestling gym and created countless monster masks for the legendary Don Post Studios. In fact, he once co-owned that particular company! As someone who started practicing music as a child it was only natural that he would end up creating numerous albums for labels like Dejavu Record Company and Electric Lemon Records (the latter of which he ran with his friend Milt Larsen). There were releases filled with romantic music, comedic tunes from his “Johann Sebastian Bork” character and, yes, he got to indulge his love of the macabre many times. Verne Langdon was sort of a one man Midnight Syndicate in his day. In addition to the subjects of this article, he also created themed albums like Music for Magicians, Halloween Spooktacular and Dr. Druid’s Haunted Seance. That last album acted as both the soundtrack to and instructions for a theatrical séance, complete with haunting voices from beyond! Although these vinyl releases were sold in stores, many know them from their appearances in the “Captain Company” ads which appeared in countless magazines from Warren Publications during the 70’s and 80’s. Selections from his various albums have appeared on the radio and on numerous television shows and his spooky music has appeared in numerous professional and home haunts across America. After a lengthy hiatus from that genre, he eventually returned with Music For Zombies and Music For Dead Things in the early 2000’s. 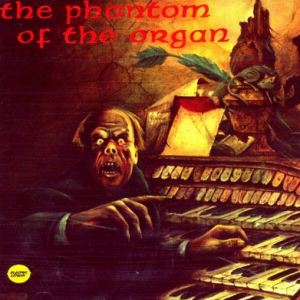 The story of how The Phantom of the Organ and its kin came to be is an interesting one. The year was 1972. Milt Larsen and Verne Langdon were having drinks at the Magic Castle and discussed how their 1967 album An Evening with Boris Karloff & His Friends had been pulled from the shelves due to licensing issues over movie clips, which were apparently caused by a lawsuit between Bela Lugosi’s heirs and Universal. They had been unable to regain control of the album at the time and decided to create their own album of scary music. As Langdon has provided the music for An Evening with Boris Karloff & His Friends and the backing music for the Magic Castle’s Houdini séance, he was a natural choice to create the music for their new project. The decision to create an entirely original collection of music for Halloween was commendable considering how many “Halloween albums” of the time were content to reuse material over and over again. The only reuse here was how it was recorded at the same studio and on the same Wurli-Morton pipe organ used for the séance! The release was a smash success and fans quickly requested more albums like it. The rest is history. I love the creepy introduction to “Horror of Erik.” It’s a perfect blend of moody organ work and other instruments (along with some soft moaning). Not only does it provide something you can use instead of “Toccata and Fugue in D minor” in your phantom organist scene, but it also sounds like something you’d hear as the theme to an old horror anthology show! It’s also a neat reference to the Phantom of the Opera. “Depression” has an eerie buildup which transitions into low, slow organ work. It admittedly sounds bit like something from an soap opera at times, but that could be said for many of the organ tracks. “Symphony of Death” starts off powerful and heavy, only to tones things down later. However, the sense of unease is always present. That’s why I think it’s perfect for any haunted house’s funeral home. The organ work in “Dementia Macabre” might begin with a soft, lurking feel but it picks up soon enough. The track certainly lives up to its name and would fit in with any spooky room. It’s also a great opening track for the first room of an attraction themed around a haunted mansion. The moaning and moody tones of “The Devil’s Love” are like something out of a dark soap opera. “Sound Trip Through the Catacombs” is the album’s longest track and runs over 8 minutes! The listener can hear the sound of a horse-drawn carriage on cobblestones, along with talking people and soft music. But then the Phantom of the Opera strikes! His heavy breathing and evil laughter immediately cause a commotion and he’s soon heard running through a wet catacomb to escape. Although the authorities can be heard, this doesn’t stop the Phantom from terrifying more people. There’s even some storm sound effects thrown in for good measure! Play this softly in some catacombs of your own when guests exit your phantom organist setup. That way it will sound like the organist is out wreaking havoc in elsewhere while looking for your guests. “Echos of the Organ” closes things out with some epic “bad dream” music and spooky organ work. It’s been a big year for news in the world of haunting ambiance. Midnight Syndicate has a new live show at Cedar Point’s HalloWeekends event called “Conspiracy of Shadows.” Performances will happen every Friday, Saturday and Sunday through October 28th and guests get to meet the group after the show! Although Jerry Vayne has joined the band Seven For Eden, he’s also working out some ideas for an upcoming album that’s tentatively titled “The Dollhouse.” Sam Haynes released Season of the Witch, Music For Haunts recently put out Clown and Dulcet Jones unleashed his new single Ghostflight. There’s a new Verse 13 EP called Killiope which consists of “The Netherworld Circus” from Prelude to the Afterlife and “TerrorKlowns.” Darkmood is working on Slasher after having spent a lot of time on his Infinite Mindscape side project’s new release SPACE (which isn’t a scary ambiance album). Rustyknife’s Sounds of Gore Compilation is no longer a Gore Galore exclusive and can now be found on several online music stores. Oh yeah, let’s not forget the 2017 episode of the podcast which is linked to those articles! The 2018 selection of free downloads will consist of both music and sound effects in celebration of this year’s theme. Prelude to a Nightmare has a massive collection of audio goodness you can download for free over at ReverbNation. But since I suspect that might be only available for a limited time, I’ll also point out how Prelude to a Nightmare’s official SoundCloud page has some free stuff as well. The selection is smaller and you’ll have do a little digging to get them, but the freebies are there. Speaking of SoundCloud, that’s where you can find a frightful field recording from SALA called “moans of a pine tree.” It’s amazing how a simple contact microphone on a tree can transform a gust of wind into spooky groaning sounds. Sinful Audio has some very informative articles filled with advice on using audio to scare people. But that should come as no surprise given how the company creates original recordings specifically for that purpose! If you missed our post about Video Store Day from earlier in this year’s Halloween Countdown, the event’s official Facebook page has all the information you need. Although the improved image quality and scene selection abilities of DVD (and later Blu-Ray) helped sell the public on switching away from VHS, many people also note how special features helped convinced them to make the switch. But, depending on how one defines “special features,” it can be argued the concept originated on VHS! While the first commentary track appeared on the Criterion Laserdisc release of King Kong in 1984, Warner Home Video unveiled a special line of VHS releases called “A Night At The Movies” in 1982. As noted on the packaging, the tape started with a cartoon, newsreel, and trailers (all of which had been released during the same year as the feature presentation). But it’s also possible the concept dates back even further! The VHS release of the 1979 obscurity Satan War includes a 15 minute bogus “documentary” on voodoo in order to make up for the short running time of the movie. However, the scarcity of information on the film prevents an exact determination of whether or not the film was released directly to VHS. If it wasn’t released that way on 1979, it’s even possible the “documentary” was included during its original release. Depending on which eBay listing you see it under, Video Gems’ VHS release of The Young Tiger was either released in 1980 or 1989. All that is known for sure this how a short featurette about Jackie Chan was included despite his not actually being the the movie (although he did have a minor role in a different film with the same name). Similarly, an 80’s release of The Terminator in Australia and New Zealand apparently included a behind-the-scenes look at Baby: Secret of the Lost Legend. Numerous anime video releases in Japan included features like “clean openings” and music videos, but cataloging all of those would be an article in and of itself! The same goes for the countless bonus features on wrestling VHS tapes. But let’s get back to a precise dates. 1985 saw the release of Prism Entertainment’s “Marvel Comics Video Library” line, which included two bonus cartoons in addition a cartoon featuring the super hero (or villain) depicted on the cover. That was a huge deal considering how many children’s entertainment releases, Marvel-related or not, were often limited to a single episode per tape. This even lasted into the 1990’s (but thankfully stopped). A Dokken music video was included on the 1987 video release of A Nightmare on Elm Street 3: The Dream Warriors and 1988 saw the inclusion of Thriller on the VHS release of Making Michael Jackson’s Thriller. It’s not too often you see what should have been the main event being included as a bonus feature! Especially when one considers how documentaries about the making of a film were usually sold separately. In 1989, Cabin Fever Entertainment’s release of Solarman included a bonus interview with Stan Lee. Eerie occasionally printed poems submitted by readers, like “Poem” by Danny Massoni and “A Dragon’s Tale” by Brad Linaweaver. 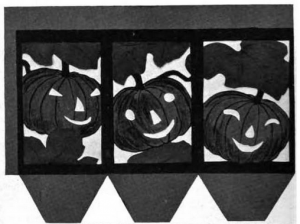 South Dakota Educator is another magazine which printed poems, although both “Jack-O-Lantern” and “Ghosts and Goblins” seem to be the work of an uncredited staff writer. I’m feeling festive, so let’s read a pumpkin poem by John Agard, “Corn Maze” by David Barber, “It Must Be October” by Pearl N. Sorrels, “October” by Dale M. Hewlett, “Haunted” by Helen M. Hutchinson and “At Halloween” by an anonymous author. In “Edgar Allan Poe,” Tom MacInnes paid tribute to the man responsible for several iconic horror poems. “Gravedigger’s Birthday” by B.J. Ward was impossible to resist given this site’s recent 10th birthday and Wilfred Owen’s “Shadwell Stair” is most eerie. Jared von Hindman’s review of Swamp Thing includes a nifty haiku and Ambrose Bierce’s ghost story “The Death of Halpin Frayser” has a haunting poem embedded in it. Can you guess the secret connection between Lu B. Cake’s “Ghoses in the Barn,” Charles J. Leland’s “Howling of the Witches,” Johann Wolfgang von Goethe’s “Dance of the Dead,” Thomas N. Weaver’s “Jack-O’-Lantern” and the anonymously penned “Goblins” after reading them all? Look Ma, “Hands” on Poetry by Adele Steiner collects numerous poems written by her students, including untitled poems about a black cat and aliens by Lennard Long and Anna Jepsen. “One Stormy Night!” by Natasha Moiseev and an untitled ghost poem by Aseem Peshwa are our next selection. We close things out with “Healing Mixture” by Hannah Jung, followed by “Spell Poem” by Caroline Torrey. Friends Productions was founded in 2009 by Stephen Valenti. Stephen, along with his parents and friends, had always enjoyed visiting haunted attractions and it should come as no surprise this led to him wanting to do one of his own. He launched the first annual Haunted Woods that year (albeit at a different location) His friends and parents have been with him from the beginning (his father even helps with the construction and lighting) and the event is supported by the Wilmington Town curator, Wilmington Historical Commission and Wilmington Minutemen! There’s also plenty of student volunteers from the local middle and high school and the proceeds are used to help with the upkeep of the tavern and its museum. I visited in 2017 on their second night of operation. My visit was later in the evening than I had originally planned on, which might explain a few things I’ll be noting later in the review. It was very dark on the road to the tavern and I was getting concerned my GPS wasn’t working properly, so it was a huge relief to see a sign and partitions explaining you can’t park in that area and where to go for free parking. The realistic Jason Voorhees dummy was a great touch and being able to see some projected lighting effects on one of the buildings helped increase my anticipation. I was directed into to a grassy area by a traffic guard and old men in colonial gear. Screams and a chainsaw could be heard in the forest nearby and only a little light could be made out among the dense foliage. This was a very promising sign of things to come. As I passed by the historic tavern, I noticed the door was open and people were inside. Looking back, I wish I had tried going in since it looked really cool in there. But since there wasn’t anything haunt-related in there, I pressed on to the waiting area. There was a food tent to the right of the ticket table, but the really interesting stuff was near the stairs on the side of the old black building. Not only was one of those red and green “light show” devices you often see in December aimed at the building, but there was also a projection of bloody messages appearing on white area (complete with sound effects)! Sadly the projector was out in the open on a table. Hopefully they’ll come up with a cool enclosure for it next time. What wasn’t so noticeable was the evil butler prop peering out a window. Despite it being lit by a dim strobe light, the effect was very subtle and those who aren’t paying attention might miss it. The wait in line wasn’t too long, but I did appreciate the other distractions. A red spotlight was pointed at the rules and it was nice to see a haunt actually have their no photography rule out in open for a change. But the two performers who occasionally came out of the entrance to interact with people weren’t the only live entertainment. Sometimes masked evil mimes would go on the stairs and do creepy little performances! Troma certainly knows the marketing power of an interesting title. It goes all the way to back to when the decision was made to change the name of “The Health Club Horror” to The Toxic Avenger during the production of said film. This understanding is also why they changed the title of Rana: The Legend of Shadow Lake to Croaked: Frog Monster from Hell and created A Nymphoid Barbarian in Dinosaur Hell by some extra footage and narration onto “Dark Fortress.” Although it appears the film was only publicly released as A Nymphoid Barbarian in Dinosaur Hell, not unlike how Roger Corman’s “Prehistoric World” was retitled as Teenage Caveman by the distributor. Night of the Living Dead went through several proposed titles before settling on the one we all know and love. The earliest version was a horror comedy about aliens called “Monster Flick” but the comedy and aliens were eventually phased out in later drafts. A work print for the film bore the title “Night of Anubis” in reference to the Egyptian deity associated with embalming and death. This eventually became “Night of the Flesh Eaters” and was to have been the actual title for the film before the distributor decided to change the name. The October 1985 issue of Boys’ Life has an interesting interview with Garfield (and Jim Davis) which foreshadows the events of Garfield’s Halloween Adventure without actually mentioning the special by name! The name “Zioptis Foundation” might be familiar to those of you who read last year’s collection of links to haunted attraction review websites. But what you probably didn’t know is how that particular haunt reviewer has a free “Dial-A-Trip” phone number which gives bizarre messages to callers! You can learn more about the phone number’s long history at the Zioptis DeviantArt page. Dr. TerrorEyes has loads of great stuff available on his Facebook page, with everything from informative lectures he’s given at haunted attraction conventions to prop ideas! Danny Seo’s Upcycling Celebrations has some great instructions on how to turn burnt-out floodlight bulbs into potion bottles. This is a huge boon to haunters who use such lights in their displays. The only problem is how the online version doesn’t have any pictures. Thankfully Organized31 does! Sew a Modern Halloween: Make 15 Spooky Projects for Your Home by Riel Nason shows how to make a fabric “Scrappy Jack block” which can be used to make festive quilts and pillows. Melody Hall’s Ultimate Halloween has instructions for a “Batty Clothespin Bat Pin,” “Goofy Gourds Centerpiece Baskets” and decorating your cubicle at work for Halloween. People of all ages can enjoy making the “Paper Bag Pumpkin” from The Toddler’s Busy Book by Trish Kuffner. Do you have any spare egg cartons? If so, How To Make Your Own Spooky Halloween Crafts by Jeannine Hill will show you how to make bats and spiders out of said cartons. She also discusses how to make ghosts using your choice of balloons or trash bags. Speaking of ghosts, Mary Meinking’s Spooky Haunted House: DIY Cobwebs, Coffins, and More demonstrates how to make “Glowing Ghosts” you can hang from the ceiling and I Love Halloween shows how a tomato cage can be used to make a different kind of glowing ghost. Some “Bone Candlesticks” would be a great match for creepy homemade candles. Those who prefer to avoid open flames should enjoy creating an “EEK Wreath” or one of these other Halloween projects.